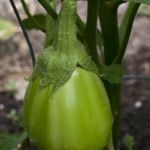 Some of the tomatoes looked like they might come back for the fall season until hurricane Harvey hit—too much water and waterlogged soils did most of them in but the peppers, eggplants and okra have come on strong. Not that there haven’t been problems—root-knot nematodes attack most garden vegetables while stinkbugs and their relative the Leaf-footed bug seem to be on everything. 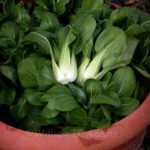 I’ve pulled up peppers that were stunted and wilting to find the roots knotted from nematode damage. 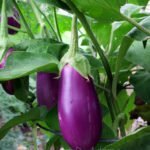 Eggplants that were seemingly healthy had knotted roots even at the soil surface. 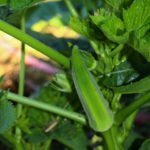 Okra is susceptible to nematodes but most are in new beds this year and producing well with daily watering. We got 30-40 inches of rain from Harvey but only a couple of inches in the month since. 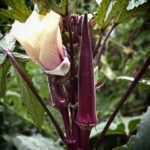 Okra is a favorite target of stinkbugs, especially the shield shaped ones, and they all love eggplants. I mash all I can, catch and spray occasionally with low-toxicity pesticides like permethrin or spinosad. Be sure to read labels carefully and observe the days-to-harvest after spraying if you use these materials. Insecticidal soaps help some, but these critters are tough and have few if any predators/parasites. 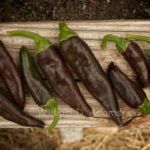 We don’t eat a lot of peppers, but they are thriving, and I planted a bunch of them this year. We like them on Philly Cheese Steak sandwiches, pizza and occasionally in a salad. 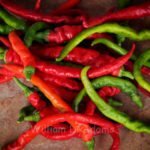 The hot ones—jalapenos, etc. are reserved for fresh salsa (with the current shortage of tomatoes we have resorted to buying Campari tomatoes at the store. Not bad really, but one box can be used up for a batch of salsa). Gold Standard was our only bell pepper. It’s been vigorous and productive but like most bells that turn yellow it sunburns easily. 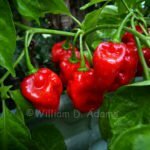 Of the smaller peppers typically listed in the “sweet category” the Italian heirloom Jimmy Nardello is the only one that lives up to being sweet. It’s not unusual for peppers that simply qualify as not hot or not very hot to be grouped this way in catalogs. 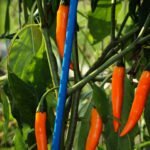 Shishito, a Japanese frying pepper, is a good example. The catalog description notes “10% may have a bit of heat” but we grew two different Shishito varieties and they leave a noticeable, but not choking, warmth in your mouth. As they mature to a red color, the same peppers seem to be milder. Perhaps it’s the Shichimi Togarashi seasoning we taste, but we have tried them with sea salt and black pepper plus olive oil and the peppers still warm your mouth. 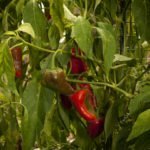 I’m hooked, but not everyone is a fan of these peppers. 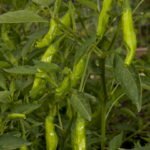 Ten-pu-la is an Asian pepper that is extremely productive and an attractive upright, stately looking pepper plant. 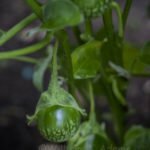 The internet source (Evergreen Seeds) shows the harvested green peppers, but they will turn red, and though not really sweet they’re good in a pepper sort of way. 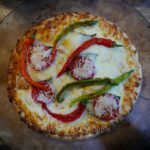 They’re also beautiful in the garden and on a cheese pizza, too. Corbaci is a similar-looking/tasting pepper (a bit sweeter). It loads up with peppers but the plants haven’t been as vigorous and attractive. 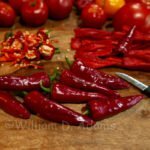 Hot peppers have varied from the mildly hot, like the previously mentioned Shishito, to a red Habanero, Xaman, that is dangerously hot. We grew a couple of paprika peppers this year—Hungarian Magyar and Leutschauer. 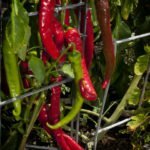 Both are considered mildly hot and they can be used fresh or dried for paprika. 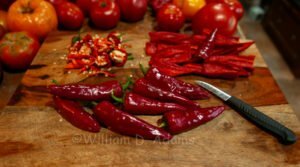 Making my own paprika seemed like fun so I set the convection oven to dehydrate and made 50 cents worth of paprika after hours of growing, harvesting, cutting up/removing seeds and other labors of love. Hope to try smoking some before dehydrating the next time—okay, gold is only slightly more precious than the final product here, but I did it. We included a couple of jalapenos— Gigantea and Jumbo—both of which were large and good. We used them mostly for fresh salsa (yes, we eat a lot of it) and even though we planted only one plant of each variety we still had some to share. Ethiopian Brown Berbere was another exotic pepper in the hot category. It seems plenty hot, but not painfully so. The spice mix based on this pepper was also ordered so we could get an impression of how it is traditionally used. Full Moon a mildly hot Thai pepper was a real beauty in the garden and to my surprise it was actually mildly hot (most Thai food is smoking hot). It’s been a banner year for eggplants. We planted ten varieties and most have been very productive. 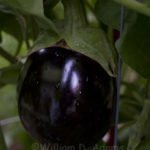 Mitoyo, a dark, purple/black variety was tasty (folks rave about it online) but in our garden it didn’t produce much. Maybe it was crowded out by more vigorous varieties and we will give it another try next year (it was good). Aswad, a Syrian variety popular in war torn Aleppo, was more vigorous and productive plus it was quite large. It was also good and will be back next year (wish I knew how the name is pronounced). Meatball and Patio Baby from Burpee probably won’t be back. 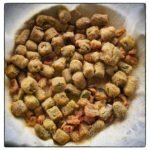 PB is too small and Meatball, other than having firm flesh, doesn’t remind us of meat—though it’s very edible. Green eggplants were well represented in the garden. One of our favorites, Louisiana Oval Green (LOG), often weighs a pound or more and “eats good” with lots of flesh and minimal seeds for the size of the fruit. 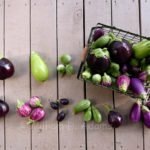 Green eggplants seem to have relatively tender skin whereas the other oddity, white eggplants, seem to have tough skin. 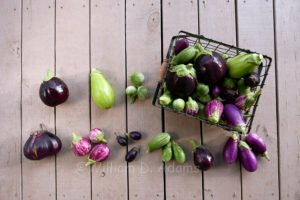 Regardless, we’ve decided we like our eggplants peeled most of the time. As a general rule, if the skin is shiny and the fruit developed rapidly, there is only a little tendency to be bitter so salting in a colander shouldn’t be necessary. Little Green was smaller than LOG but it was almost market size and a beautiful light green. It’s in next year’s plan. 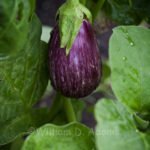 Masego was smaller yet and shaped like a teardrop, but large enough that it found its way into eggplant casseroles as well as being breaded/fried and seasoned with Creole seasoning salt. By the way, remoulade sauce makes a great dip for fried eggplant! 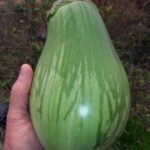 Petch Siam is a small, round and green Thai eggplant that seemed a bit seedy if picked larger than a golf ball. However, the stinkbugs really liked it and we usually agree with veggies that stinkbugs prefer as they’re always on the best-tasting tomatoes. 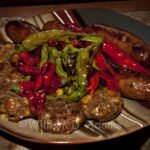 We fried a few and cut some in half, dredged them in olive oil and spices then grilled them on the charcoal grill—small but good. Hopefully they will last a while so we can try some Thai recipes. Little Sailor was a beautiful lavender/white striped eggplant that was very good but it had serious sharp prickles on the calyx. 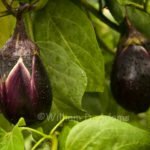 After cutting, I would recommend using the pruners to snip off the prickles to save the other eggplants in the bag and your fingers. Dancer, a small lavender, teardrop shaped eggplant was immensely productive and quite delicious (another stinkbug favorite). 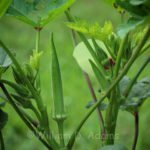 It’s also been a great year for okra. We’re still picking about a gallon every two days from the eight varieties in this year’s garden. 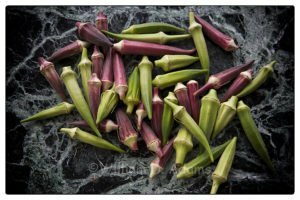 For the most part we consider all okra to be good but we do have some preferences. 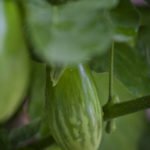 Some varieties, like the new Jambalaya, produce pods that are thin-skinned and hollow. 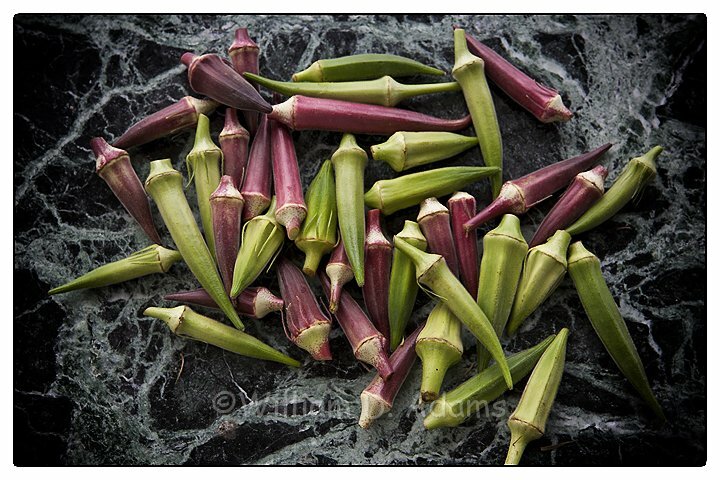 We like a branching plant with okra pods that are “meaty” and well filled. Of the eight varieties, two selections—Bill’s Thick and Bill’s Skinny— are our favorites. Mama Paytons is an excellent one. 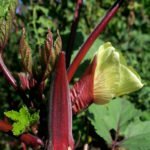 If you’re interested in the red okras, we like Aunt Hetties best although Candle Fire is good, too. 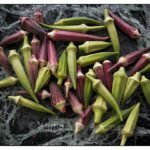 Lady Finger and Sparkler are Asian varieties. They probably deserve another year in the garden but I have some controlled crosses with red varieties and Bill’s Thick/Bill’s Skinny that will take a lot of space so there might not be room. 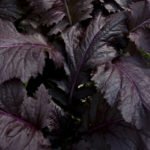 We’re currently well into planting the fall garden with new varieties of lettuce, kale, Asian Greens and more than a dozen short day onion varieties planted from seed. 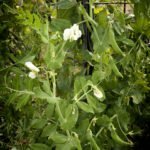 Edible-podded peas like Sugar Daddy are planted in a number of the tomato cages. If we have a mild winter everything will thrive, if not, we will still have the more hearty kale to enjoy and share!